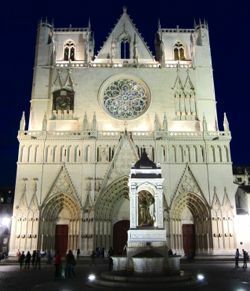 Roman ruins, beautiful churches, a medieval district, fine museums and modern film festivals, Lyon has a lot to offer. Concentrate on the Presque'île and Vieux Lyon to start. Lyon sits at the confluence of the Rhône and Saône Rivers, in the Rhône-Alpes region of France (map). The areas of most interest to tourists are found on the Presqu'île—the peninsula between the two rivers—and Vieux Lyon, on the banks of the Saône. The two parts are easily connected by pleasant passerelles, or foot bridges. 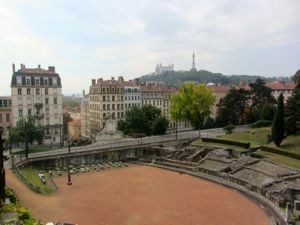 Roman Amphitheater, on the Croix-Rousse Hill. Above, Cathédrale St-Jean, in Vieux Lyon.